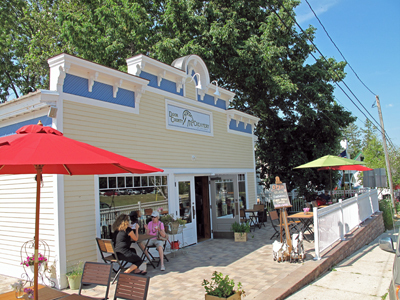 Door County Creamery, new in 2013, is a specialty shop dealing with home made artisan cheeses, goat cheeses, and more. Open 11AM - 9PM in season, this shop is owned and operated by the same folks who own the terrific fine dining restaurant in Sister Bay, The Waterfront; and the casual dining and bar establishment called JJ's / La Puerta also in Sister Bay, and JJ's of Jacksonport in Jacksonport. Jesse, the head chef at The Waterfront (awesome chef) also is in charge of the cheese production. We stopped in and met with JJ and Jesse to see what they are up to. The cheeses are flying out the door, and are delicious. You can also get some fabulous sandwiches here, buy a bottle of wine, sit down and eat! What a great addition the Door County scene, and another great entry in the "artisan" trend that is happening. Jesse explained to us that he is making a variety of cheeses and what is available is posted on the blackboard each day, along with what sandwiches are available for your pleasure. So stop back often, as you may find new surprises on any given day. They have a goat farm about a mile from the shop and that's where their goat's milk comes from - and the cheeses are made right here on the premises. There are some tables outside and inside if you want to take your sandwich or cheeses, and snack on the premises. The building is fresh, cozy and welcoming. We sampled cheese curds and a variety cheeses. All great. 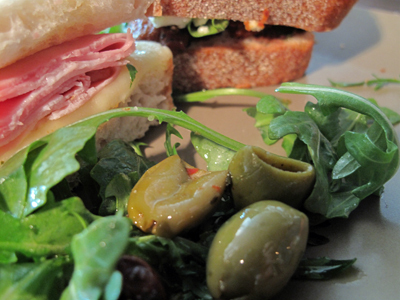 We then tested a Rosemary ham and Alpine cheese sandwich - spectacular! And then a Chevre Torte sandwich - personal favorite - with an olive/tomato paste smear and spinach and Chevre cheese - oh this was good (pictured here). Cheese Maker's Chocolate - smooth, rich and creamy. Pistachio - loaded with flavor. Great. Roasted Almond & Fig - awesome! Salted Caramel - my favorite! 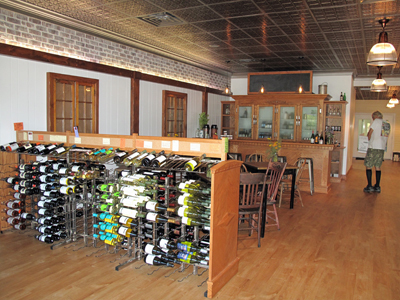 Our DoorCountyNavigator.com reviewers saw lots of folks tasting and loving the cheeses, and making purchases. The cheeses we sampled with excellent - these guys do everything right in all of their businesses, so expect the same here. Great stuff. Expect the best from Door County Creamery - this family does everything first-class. You will get a good idea of the kinds of things Door County Creameryoffers from perusing hte blackboard below. The Brie Torte is supposed to be superb, tho we did not sample it at the time. Again, they do it right so expect the best. 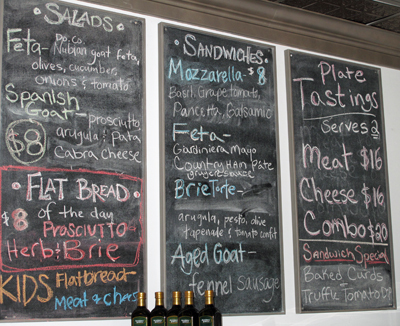 The menu and offerings change, but the quality will remain consistent. Jesse is a fabulous chef, and now artisan cheesemaker as well. At DoorCountyNavigator.com, we're expecting to see some of these cheeses and offerings to appear at The Waterfront. You can sample cheeses at the counter, and purchase favoites like cheese curds as well. Grab something to eat, buy some wonderful cheeses . . . and yes, home made gelato as well! Open 11AM - 9PM in peak season (April - October). Great shop - you will enjoy. And please tell JJ and Jesse and the gang that DoorCountyNavigator.com sent you!